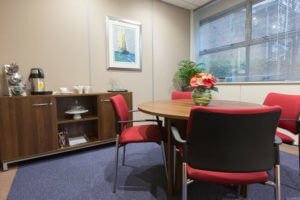 Hyde Park House Business Centre offers a friendly, professional environment in which to hold your meeting, interview, training session or networking event. 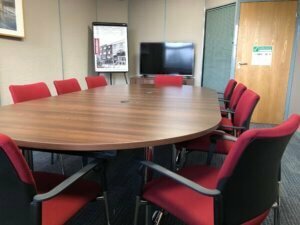 To keep things simple, our meeting rooms are priced by the hour, half day or full day. 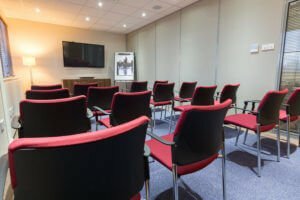 Hyde Park House boasts two stylish meeting rooms equipped with the latest presentation technology and managed by our dedicated Business Centre Team who are always on hand to ensure your event runs smoothly. NEW MEETING ROOM LOYALTY CARD – For each hour booked you will receive a sticker on your loyalty card. Find out more and full terms & conditions on your loyalty card. Available from reception. 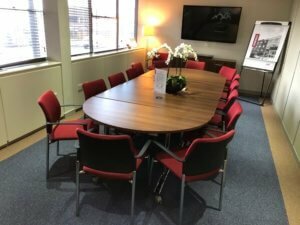 Light refreshments are provided free of charge but our Business Centre Team are also happy to meet more specific food and drink requirements including continental breakfast pastries, buffet lunches and afternoon tea. All catering is provided by our on-site Coffee Lounge. If you arrange more than 10 hours meeting room use, you’ll qualify for one hour free of charge.